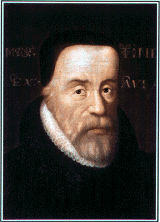 William Tyndale was born about 1495 near the Welsh border. He received bachelors and masters degrees from Oxford and also studied at Cambridge. Ordained about 1521, he spent his early ministry as a domestic chaplain and tutor in Gloucestershire and London. Tyndale was a man with a single passion—to translate the Holy Scriptures into English. Lacking ofﬁcial sanction, he went to Germany in 1524. Strongly opposed to his work, King Henry VIII, Cardinal Wolsey, and others, sought to destroy his work and put him to death. 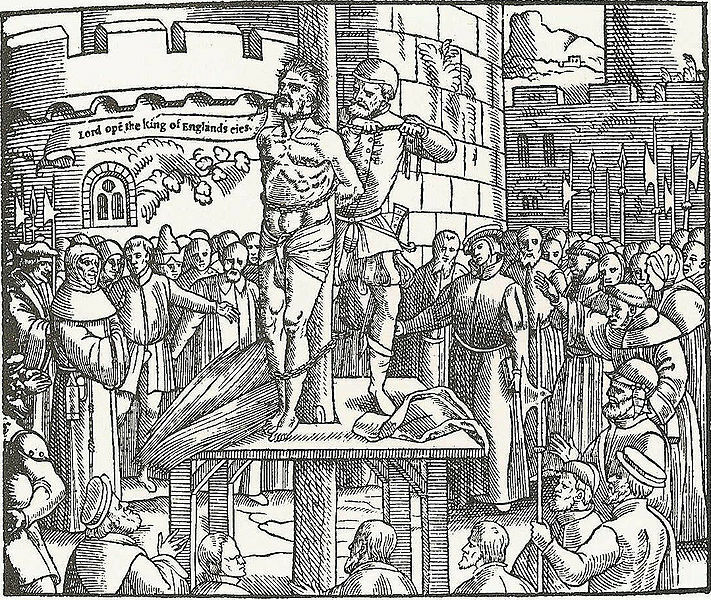 He was betrayed by a friend and was strangled and burned at the stake on October 6, 1536, in Brussels. By the time of Tyndale’s death, he had completed his translation of the New Testament and major parts of the Old Testament, particularly the Pentateuch. 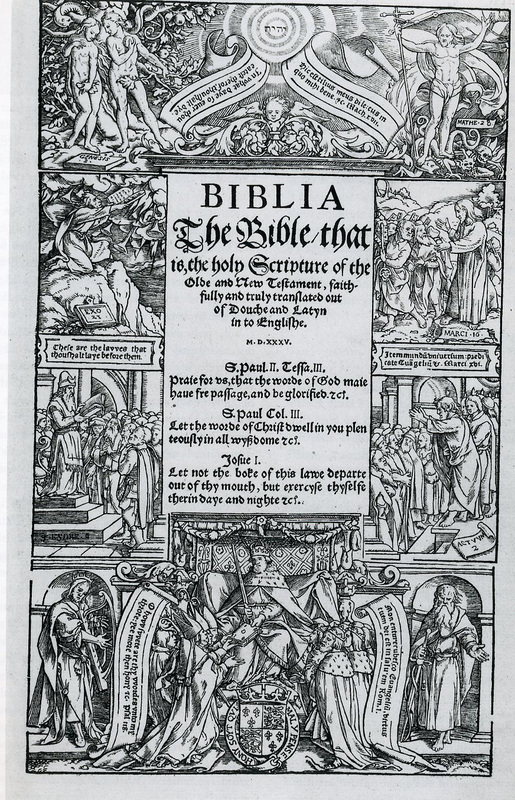 It is estimated that about eighty percent of Tyndale’s work found its way into later translations, notably the Authorized Version of 1611 (King James). Miles Coverdale was born in Yorkshire around 1488. He studied at Cambridge and was ordained in 1514 and soon thereafter joined the Augustinian Friars. Passionate about scriptural translation, he left the monastery in 1526 and eventually went to the Continent where the work of translation enjoyed strong support. He completed the ﬁrst translation into English of the whole Bible in 1535, which was issued as “The Great Bible” in 1539. 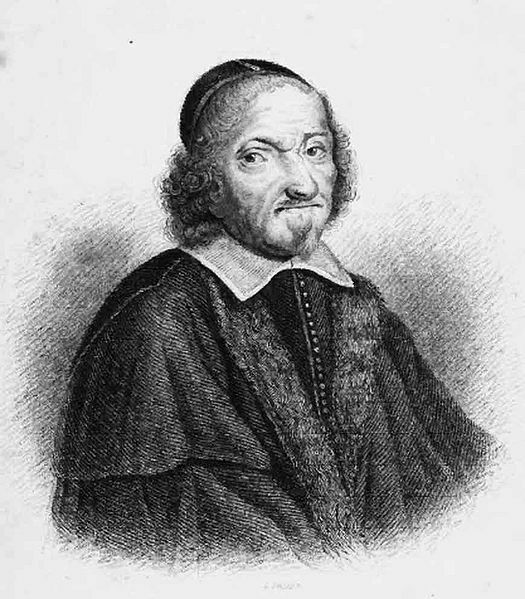 Archbishop Cranmer adopted Coverdale’s translation of the Psalter for the Book of Common Prayer. Between times of unrest and relative calm, Coverdale shuttled between England and the Continent. He served as a Lutheran pastor while in exile from 1543-1547. He became Bishop of Exeter in 1551 but was deprived of that ofﬁce at the accession of Queen Mary due to his Protestant convictions. He again escaped to the Continent where he lived until the accession to the throne of Elizabeth I in 1559. He is remembered as an outstanding preacher, an uncommonly gifted linguist and translator, and a leader of the Puritan wing of the Church of England. I Almighty God, who didst plant in the heart of thy servants William Tyndale and Miles Coverdale a consuming passion to bring the Scriptures to people in their native tongue, and didst endow them with the gift of powerful and graceful expression and with strength to persevere against all obstacles: Reveal to us, we pray thee, thy saving Word, as we read and study the Scriptures, and hear them calling us to repentance and life; through Jesus Christ our Lord, who liveth and reigneth with thee and the Holy Spirit, one God, for ever and ever. Amen. II Almighty God, you planted in the heart of your servants William Tyndale and Miles Coverdale a consuming passion to bring the Scriptures to people in their native tongue, and endowed them with the gift of powerful and graceful expression and with strength to persevere against all obstacles: Reveal to us your saving Word, as we read and study the Scriptures, and hear them calling us to repentance and life; through Jesus Christ our Lord, who lives and reigns with you and the Holy Spirit, one God, for ever and ever. Amen. From Holy, Women, Holy Men: Celebrating the Saints © 2010 by The Church Pension Fund. Used by permission. To post a comment, your first and last name and email address are required. Your name will be published; your email address will not. The first time you post, a moderator will need to approve your submission; after that, your comments will appear automatically. Good commemoration and an important one. Thank you! Shouldn’t the collects include the word “English”? Collect: This collect is nearly the same as Lesser Feasts and Fasts 2006. Bio. Both of these gentlemen need ‘who they are’ and ‘why they are important’ statements. And, though Tyndale has a ‘He died’ statement, Coverdale needs one. Instead of the Epistle and Gospel now assigned, why not use readings that not only fit the commemoration but also show off Tyndale’s gifts as an English stylist: 1 Cor 13:1-8 and Matthew 6:24-34?. I wish we could find room in the bio for Tyndale’s words to a priest who suggested, like the Bishop of Pennsylvania not long ago, that the church was a higher authority than God’s word: Tyndale replied that ‘if God spared him life, ere many years he would cause the boy that driveth the plough to know more of scripture than he did.’ Tyndale’s answer to the priest contains an important biblical truth, that better knowledge of the scripture is the key to a better understanding of its place in the Christian church, and the reason why faithful translators of it deserve to be commemorated. In the collect, I wish we could avoid phrases like ‘consuming passion’. Not all such passions are inspired by the Holy Spirit, even in those who are being inspired by that Spirit in other ways. What we know for sure is that God gave Tyndale an important work to do, and that he worked patiently at it, and I think we do better to stress the doggedness than the passion. I don’t think any church historian would put Coverdale in the same league as Tyndale, and that they don’t belong together. If we have to pair people up, it would be better to put Tyndale with Jerome. Coverdale is memorable chiefly for his Psalter, which is still widely used across the Anglican Communion in the 1662 Prayer Book, and he might be better paired with a liturgist than a translator. Wile I can undestand the objection of some, I think adding Coverdale to the existing Tyndale commemration makes sense. They are the principle authors of the English Bible. I would certainly not consider Coverdale a liturgist. He was the most Reformed of te Edwardian Bishops and almost wasn’t consecrted because he refused to wear vestments. He finally agreed to wear them for his consecration, but never did again. The Great Bible is his work and that alone should commend him. I like the reading from I Corinthians on the resurrection better than the James passage assigned to Tyndale in LLF.. Here we have a subheading which doesn’t mention that those honored were priests. For the sake of conformity, I suggest “Priests and Translators of the Bible”. To state baldly that Tyndale was betrayed.”by a friend” leaves one thinking “Some friend!”. It is believed that the man (Phillips) was an agent sent to “set him up”. I would simply insert “supposed” before “friend” in line 5. The story of Tyndale’s terrible death may be confusing to many readers: (“if he was strangled, why did he need to be burned?”). I suggest that, in line 5 of the second paragraph, after “friend”. continue: “; condemned to death, he was first strangled in a failed attempt at mercy, but survived, only to suffer the agony of being burned alive at the stake”, or some such. In lines 4 & 5 of the third paragraph, I suggest a change in the word order to: “Authorized (King James) Version of 1611”. In line 2 of the fourth paragraph, avoid the clumsy repeated use of “and” by substituting a comma for the first “and”. As far as I am concerned, Tyndale is the most remarkable translator of our scriptures ever. The KJV leaned heavily on Tyndale. One man. A martyr. On the other side a crew of great erudition. I am increasingly disappointed with the translations that have come forth endlessly in my lifetime, each with the language more pedestrian than the last.